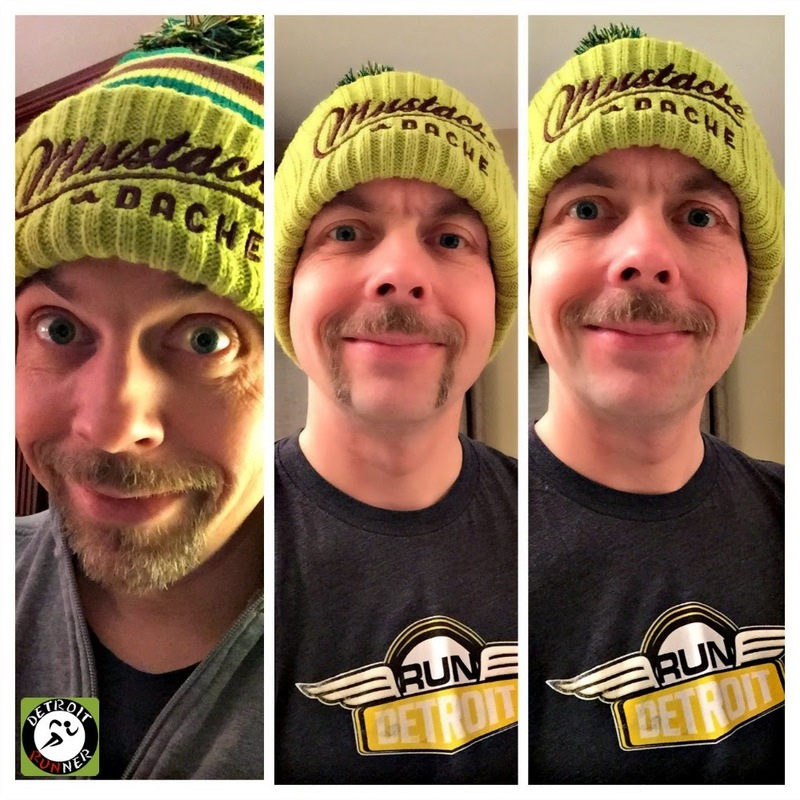 RUNdetroit outdid themselves for the second annual Mustache Dache 5k. This remains my all time favorite 5k. Yes, ever! The race is well organized. The course is my favorite 5k course. There's Atwater beer at the finish and you can't go wrong with that! The race is also a competitive race if you want it to be but walkers are welcome. The post race mustache themed party is so much fun and it's not over crowded. If you have missed doing this race the last couple years, you need to put this on your "must do" list for next year right now. Don't wait to register either because it sells out. I can already tell you I'll be back for next year. Registration was very simple and done online like most races these days. The race had a website where you could register and answer all your questions. The race had several options for packet pickup. 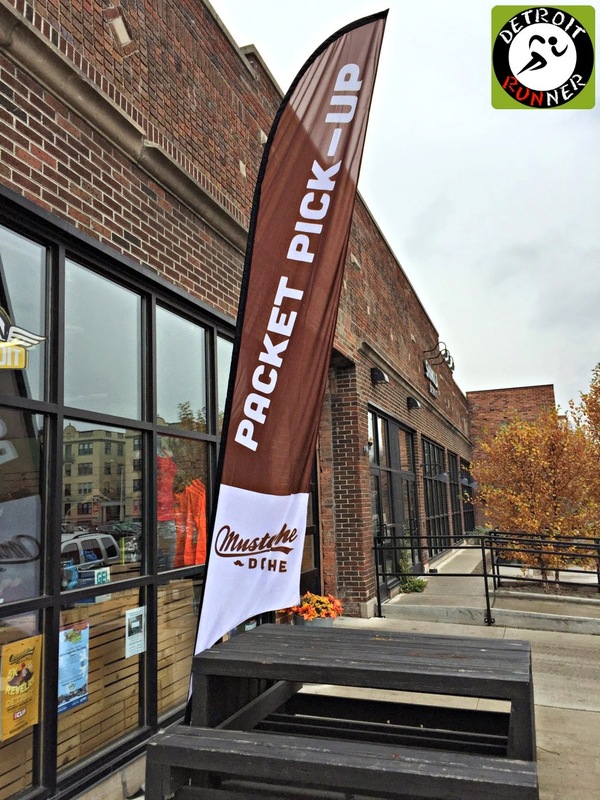 You could make your way to RUNdetroit's store in Midtown on either Thursday or Friday and get your packet early or you could pick up race day. I always feel that races should offer both to give runners options and three options is more than enough. I decided to pick up my packet on Thursday. I'm always an early guy and could go race day but I like knowing I've got my packet so I can just show up. RUNdetroit had everything well organized and ready with a list of runners names and bib numbers to get you in and out easily. I went at my lunch hour and was out in a few minutes. Sometimes parking can be a little tricky there but I always seem to get a space on the same street. The race started at 10am which is a nice change of pace. I didn't actually leave my home until 8am and I could have left even later. This meant I didn't need to go to bed really early and I still got 8 hours of sleep. I also like the later start because we are already drinking beer early enough when it's a 10am start. I got a parking spot very close to the front and was able to wait in my car for a little while before going into the start area. It was raining a little but but nothing bad and frankly, I train through all weather anyway, so it really doesn't matter to me. The race had everything all set up when I got there. The start area, with all it's sections, were ready for the runners as well as the start line was set up. The race offered mustaches for people that didn't have a real mustache. I didn't get the cost but remember it was not much last year to do it. Many people also brought their own fake mustaches as well. Of course, lots of guys grew them too. This was also where the post race party would be and what better way than to finish with beer! Chrysler's Great Lakes Business Center headquartered in Detroit was there to support the race and local businesses as well. They had some of their awesome cars out on display including the new 200 which was in an cool blue color. They also had some freebies to give away! It looked like there were lots of interested runners getting in on the action. Once again, the race had the mechanical bull. I mean, how many races can you say you've been at that has a mechanical bull. You know your in for a good post race party when you see this at a race. Ha! Of course, if you didn't get your packet at RUNdetroit, you could come to the area where they had your bib numbers in order to get your packet right there. The race also offers gear check which I can't believe they even offer it for a 5k but there were many runners using it. It's certainly a nice service to offer, although I didn't need it today. Afterwords, results would be posted here as well. Once you had your bib number, packet pickup was ready to go too. They had plenty of volunteers there to help you get your packet. Just make sure if you pickup that day that you leave yourself enough time to get your stuff back to the car or put into gear check. All of this area was right across the street from the Atwater Brewery. Since it was a little chilly this year, I made my way inside to the brewery to stay warm until it was closer to race time. There were lots of runners in here doing the same thing as well as many of them drinking too. Yikes! I'm not sure I could drink beer before a 5k race, or any race for that matter. Well, maybe a beer mile. Ha! 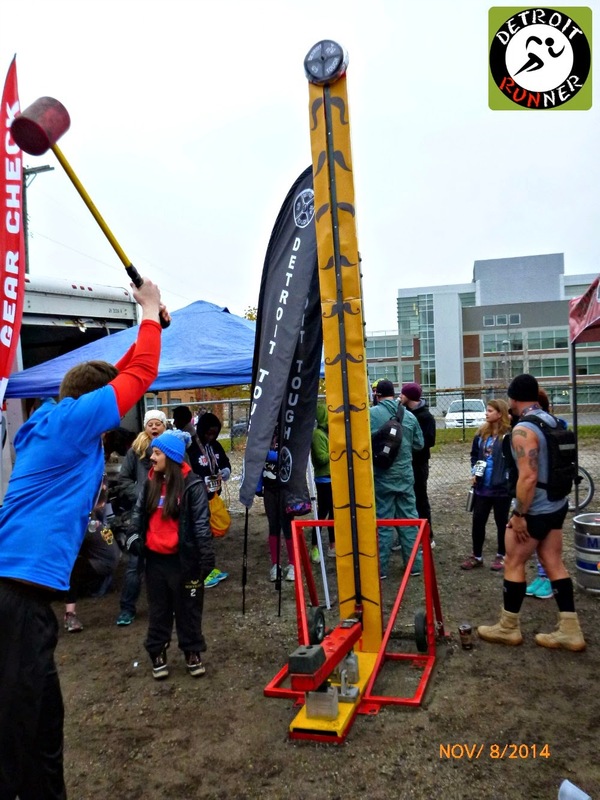 There were lots of SEMR(South East Michigan Runners) there for the event so I was able to see many that I already knew as well as some new runners as well. I met Michelle and Jennifer at a night run that I organized earlier in the year so we got a quick picture before the race. I also saw Valerie. Well, actually it was really hard not too see her given the Hulk Hogan costume she had on. It was one of the best costumes there. Me? I'm just the creeper mustache guy. Ha! I was also able to get a group picture with the SEMR crew and, as you can see, there were lots of us there. This was about 20 minutes before the race started so I went back into the brewery to remain warm. The great thing is this race had about 1,400 runners so it was not overly crowded which is nice. I can imagine that they could probably support many more runners and still not feel like too many people - especially given this sold out again this year. I was also able to catch a quick picture of Justin, the race director and co-owner of RUNdetroit. Of course, he was really busy so we said quick hellos and I let him get back to running the race. Next up was the kids race. This was new this year for them. They had several age divisions and the kids got capes as well as metals. It looked like the kids had an awesome time and what kid doesn't like to run in a cape or get a mustache? Next up was the 5k race. The race did the National Anthem via an electric guitar and we were ready to race! I had a fun group behind me as I was taking pictures of the crowd. First time in any race that people got all crazy when I was taking this picture. I warned them, they would be on the blog. Haha! It's a great picture too! People behind me - you think they are ready to race? ha! Given it's near the end of the season, I didn't really have any special goals for the race. The race is a very flat course and a great place to try for a new PR. My speed has not been what it was in past years but I was pretty happy with my results. I ran it last year in 23:25. My age group was pretty competitive as it was a 40-49 age group. I'd like to see the race take this to the typical 5 year age brackets but frankly, even then, my group still is seriously competitive. That said, I would have placed 3rd in the 45-49 age group. The course itself is my favorite 5k route. I absolutely love everything about this course. It starts in an industrial area with a cool urban feel. It takes you past GM headquarters and around to the water front which, in my opinion, is one of the nicest areas in the City of Detroit. It also takes you through the State park too and back to the industrial area. It's an absolutely gorgeous course. Don't let my elevation chart scare you. This course is pancake flat. If you are looking for a PR, this is one to try for sure. We had a little headwind the first half of the race so that slowed me down a bit but I was able to pick it back up for the second half and finish fairly strong for me. 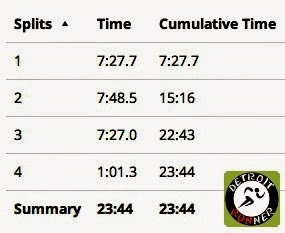 That time(officially 23:41) is well over a minute off my PR but I was still very happy with keeping things in the 7+ minute range. One really great sign that I saw was how runners should line up. I think more races should have things like this. No offense to walkers but they should not be at the front of the pack. It seemed that those of us in the front were right where we should be and I felt that everyone overall lined up pretty well. This is a great sign that all races should have! It was sprinkling a little as we started the race. You can see below that it was not too crowded and we got a nice view of the Renaissance Center we were running towards. This part of the course has an industrial, urban feel to it and I love the character of all the old buildings in the area. Quickly enough, we were running next to Chene Park and on our way towards the waterfront. You can see that it was still wet out but, the longer we ran, the less it was raining and it stopped completely by the finish. I enjoy running this because it kind of feels like the first goal is to get to the Port Authority and then it's all easy from there(even though it isn't). 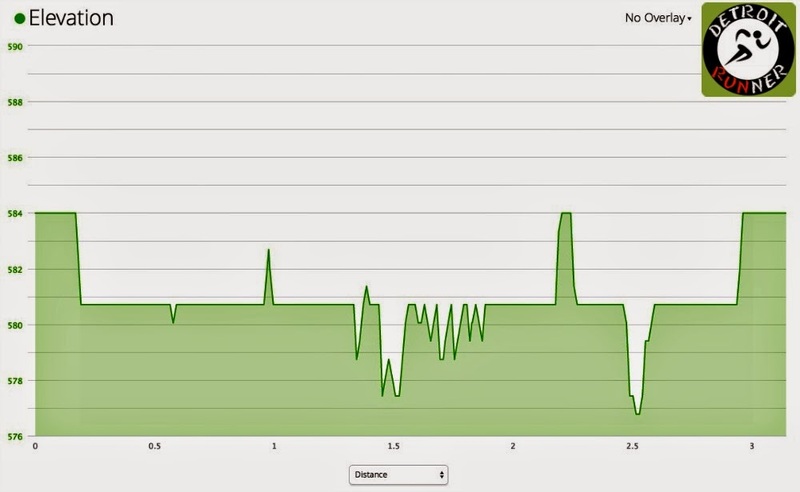 I break up the course like that to make the 5k feel less painful. Jeez 5k's are hard! The City fixed up this area several years ago and really made it nice. We made our way past GM headquarters. It's really a very nice place and, while I wouldn't want to fight the traffic to work downtown, those that work there have a nice waterfront view and ability to walk or run at their lunch hour. The Port Authority is the turn around point in the race as we run around that building. There's a nice downhill area here where you can make up some speed that was lost from the wind today. 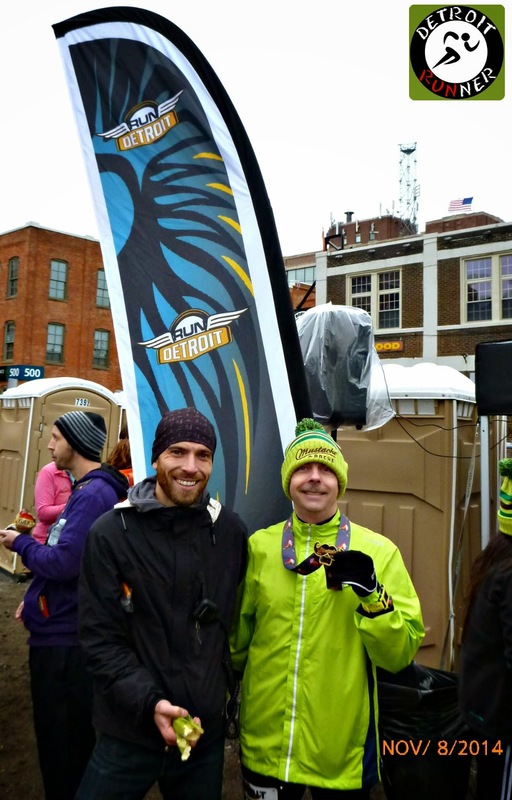 I also saw many RUNdetroit team runners out there with their wings on their back. That's a great design! Police support was great again this year and they helped keep us safe. I never saw any cars around which was one thing runners didn't need to worry about. The next section of the race is all on the water front. That's Canada you see below. GM had this awesome mural that we ran past. This was not here last time I ran here and it was pretty cool looking. You can see how nice it is to run here. I love running races in Detroit! While we didn't have the sun out for today's race, it was still a very pretty view of the water. You can see see a freighter going down the riverfront. There were still lots of runners coming up from behind and I was able to get a clear picture of them coming along by the Renaissance Center. This part on the waterfront is one of my favorite places to run. You can see some of the trees still have some color on it and then with the water on the other side, you have plenty to see to keep your mind off running strong. I had to quickly stop at this point because I wanted to turn around and get a picture of the GM headquarters as well as the Ambassador bridge in the background. Sorry for some of the cloudy pictures as some rain got on the lens as I was running. We also ran past the carousel and fountain. This looks amazing in the summertime as well. Many may not even know there is a State Park in downtown Detroit but there sure is! For those that didn't know it, Milliken was a former governor of Michigan. It's a beautiful area to run and the State does a great job keeping it look awesome. We have a little jog outside of the park and onto the streets before we head back into the park again. The volunteers did a great job and there were lots of them on course as well as HAM radio personnel helping out too. There was no question which way you should be running based on all the markings and volunteers. The course was well marked! We got to see a freighter going by as we entered back into the park. A nice treat to see especially when you don't run on the riverfront all the time. After going out of the park, you were back on the streets and heading back to Atwater for a nice after race beer. Just as you pass mile three, you could see the finish line. RUNdetroit had their awesome new sign up and it looked fantastic. I love how they did the finish line with their logos but still left room for the race logos on the sides too. I also love that the finish has fencing lined with the race name on both sides. It makes it feel very personalized, as it is! This year the race offered a hydration station during the course. I didn't use it but it was nice to see they offered it especially for those that wanted something. The volunteers there did a great job and were ready for the runners as we passed by. After you finished, they had volunteers giving out the race medals and this years were a great new design. Marcela working the medals - thank you for volunteering! After you got your medal, you walked into the post party area where the race offered coconut water, bananas, pretzels, beer and water. I may have grabbed a banana but they were all green so I took a pass on that. Frankly, because I was having beer, the banana didn't seem that appealing anyway but the pretzels certainly made sense. Those that didn't drink the beer probably would have opted for a ripe banana. I kept my eye on the prize, which for me, was the free beer you got after the race. This year the race switched from draft beers to cans. I can certainly understand the need to go to cans with a larger crowd but did miss the draft. They only offered the Lager which, don't get me wrong, is great beer but I would have liked to also see Atwater's Dirty Blonde or Grand Circus IPA to pick from given we were right at the brewery. The brewery was also selling draft beer not only outside in the party area but inside of the brewery. This gave you more options if you chose to have something different or additional. By the time I drank my beer, the results were already being posted for the race. I thought I ran a pretty good race and was surprised I was 11th in my age group. I told you that while this race is a lot of fun, it also brings some strong runners too. One of the best things about this race is the post race party. Lots of runners having fun with conversations about how they did after the race. The race also had music going on too as well as some entertaining things for the runners to do(see below). It's one of the most unique post race parties I've been too which makes it really fun. The race had chairs and table set out for the runners but it was still a little wet out so most of us just stood up. It was nice to have place to put your things down and talk though. As far as some of the unique entertainment, the race had a hammer where you could try to hit a bell like at a carnival. People were having lots of fun with it. They also had a see-saw shaped like a mustache. The adults were having more fun with this than the kids. Ha! The race had a place you could take pictures. They had a mustache and banana that you could hold for the picture. It looks like it made for some really fun pictures. 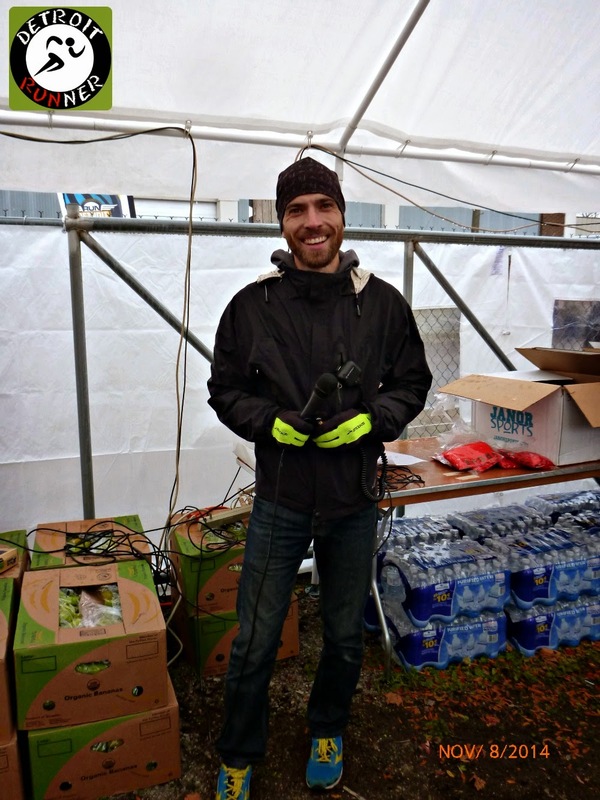 For your race entry of $33.29(I registered early and online), you received a chip timed, measured course with police support and an aid station on course. You also received free parking that was patrolled by security. 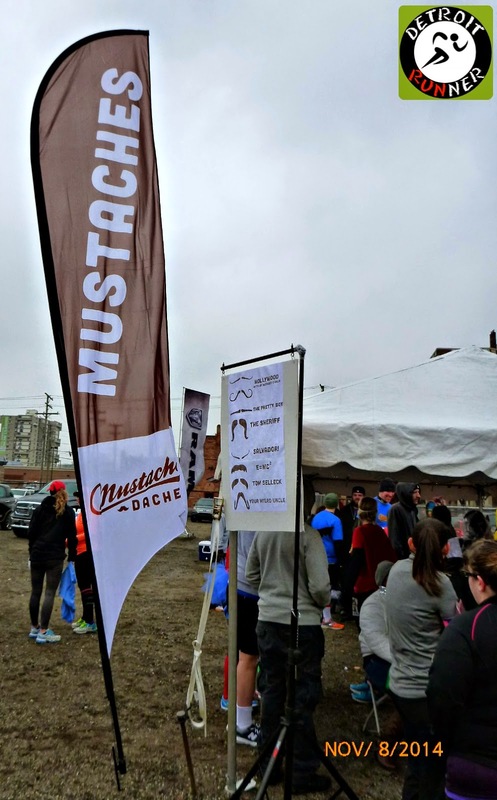 You received a custom Mustache Dache race bib with a free beverage ticket. 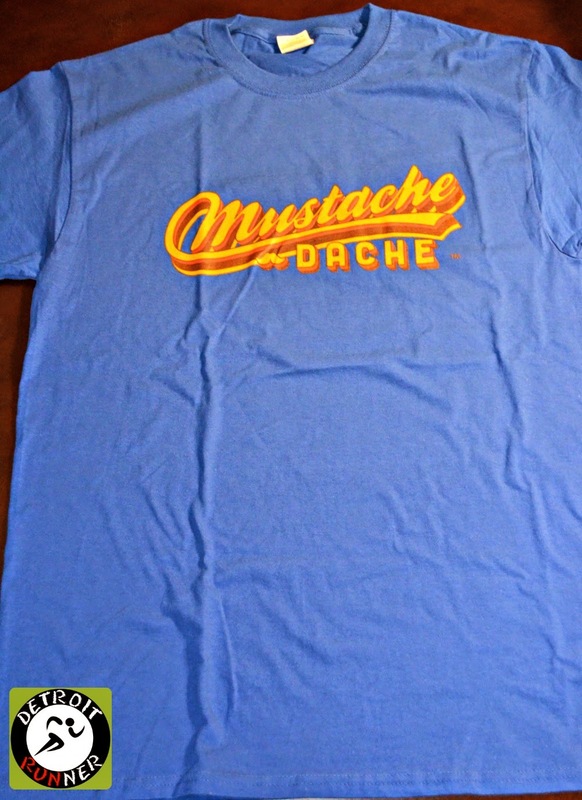 All 5k runners received a Mustache Dache retro race shirt that is cotton. It's a color I will wear so this will get used and it's not labeled with all kinds of sponsors on it. The kids got capes and medals too. 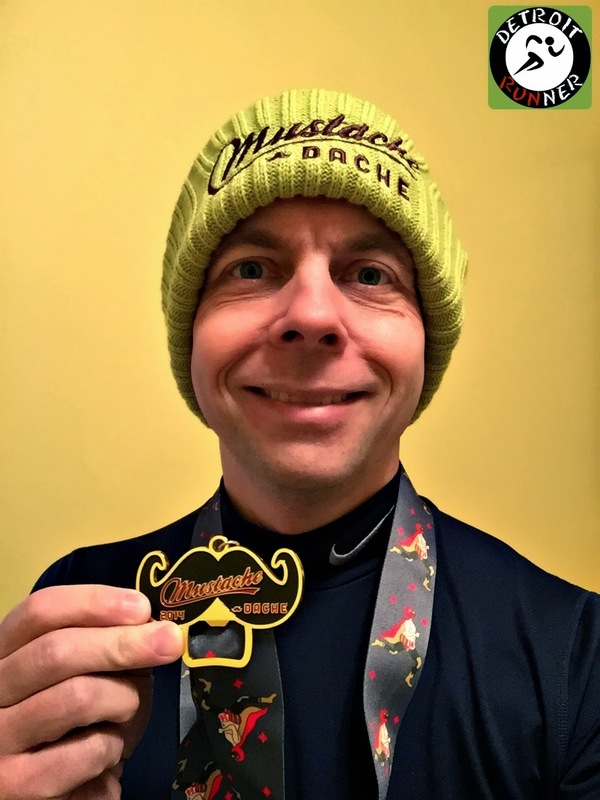 All finishers received a custom mustache medal that also doubles as a bottle opener. In addition, the bib is a custom bib with the mustache theme. I feel the medal was much nicer than last year. I also liked that they changed it this year too so that I didn't end up with another medal exactly the same. I hope that trend will continue for future years. Something I didn't even know was included was free race pictures. I love when races do this! I got several(4) pictures but here's one of them. I wish all races would start doing this. I don't get enough pictures of me actually running in the race so it's nice to get these. 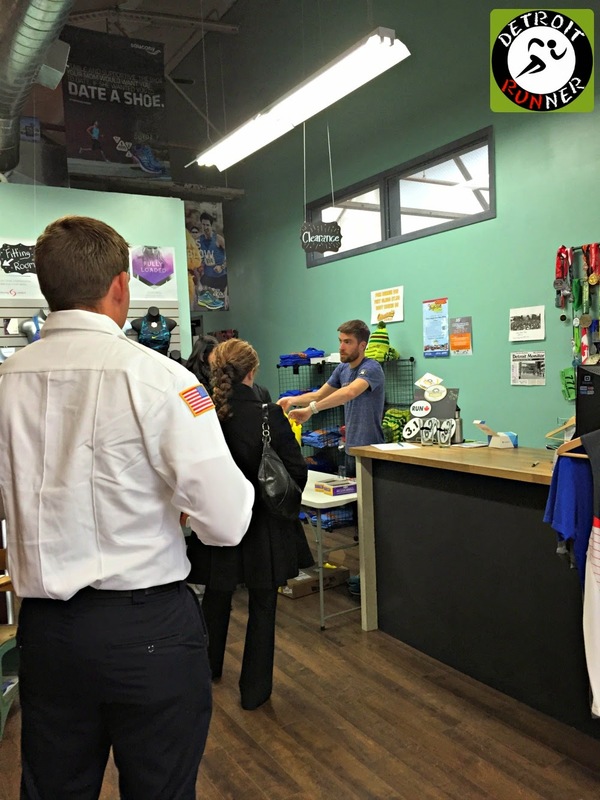 While not included with your registration, you had an opportunity to purchase race merchandise at the RUNdetroit packet pickup. They had race glasses, beer koozies and winter hats. The hats are very high quality and nice and thick material. While I would not normally wear this for a race, given it's a short race, I figured why not? I had fun with the hat before the race too as I decided what to do with my mustache for the race given I started with a goatee. Hats were really cool(and greener than this picture) but not included. You really can tell when a race is organized by runners. In this case, RUNdetroit and they know their stuff. This is one of the most organized races I've been to. The website is clear and has all answers. They had an event set up on Facebook with some information. There were several emails given to runners prior to the race with information. The start and finish area were well planned out for the runners. They had enough port-o-johns. The race was well marked. There were plenty of volunteers. Best of all, you could see that Justin, the race director, was working hard to make sure everything was going smooth. Always a great sign to see that! One minor error I noticed was the race bib had the incorrect date of the race on it. Frankly, I didn't even notice it until someone at SEMR said something online about it. Organization was top notch! Overall, there is no doubt this will be a race that I do again. It's my favorite 5k race of all time! RUNdetroit does such an amazing job on this race and it's clear that they are looking to make sure the race maintains a high quality of standards for the runners. They could easily quadruple the size if they wanted to given the demand but they are trying to maintain standards to keep the race a high quality event. 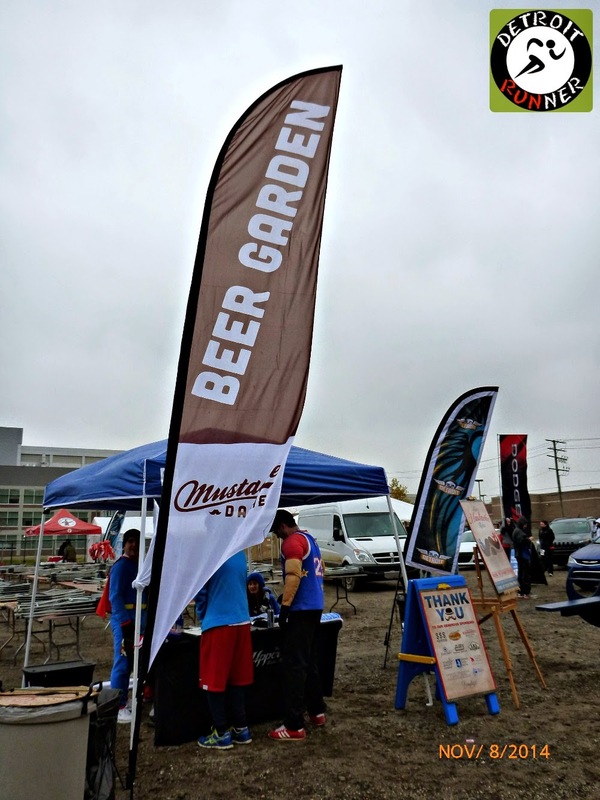 The course keeps me coming back(even though other event directors have used similar ideas based on this race), the post race party and theme of the race is so much fun and they do give a portion of their proceeds to charity for Movember. It gives me a reason to grow some facial hair once a year. So I'll say it right now - I'll be back next year. You should come too. Now just so you know, while I had fun with it, I just could not keep that mustache. Haha! It just didn't fit me so as soon as I got home, off it went! Next year I'm thinking a full beard or sticking to the goatee. I have so much fun with this race! Yeah - the creeper mustache is gone - thankfully - hah! Disclosure: I paid for this entry with my own funds and all opinions are my own. I did receive a complimentary race hat. I am one of the crazies behind you :) It was a great race, and I hope to be back last year. Thanks for the feature on your blog! looks like a fun race and one you could race... Now when do you race again... By race I mean line up and shoot for a fast time? We didn't do it this year but we did it last year and we loved the course!